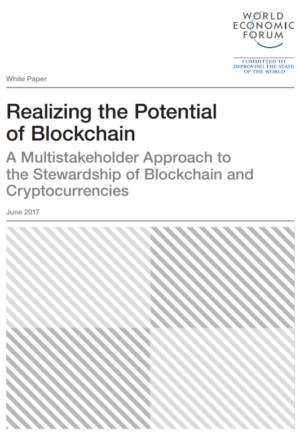 Realizing the Potential of Blockchain: A Multistakeholder Approach to the Stewardship of Blockchain and Cryptocurrencies is a white paper produced by World Economic Forum, that tries to shed light on blockchain governance challenges and multistakeholder cooperation opportunities. More specifically, this report provides a structured analytical framework and taxonomy for use by industry, technical, governmental, civil society and other stakeholders in considering how they might collaborate to resolve problems and unlock opportunities beyond the reach of any single actor. Like the first generation of the internet, this second generation promises to disrupt business models and transform industries. Blockchain (also called distributed ledger), the technology enabling cryptocurrencies like bitcoin and Ethereum, is pulling us into a new era of openness, decentralization and global inclusion. It leverages the resources of a global peer-to-peer network to ensure the integrity of the value exchanged among billions of devices without going through a trusted third party. Unlike the internet alone, blockchains are distributed, not centralized; open, not hidden; inclusive, not exclusive; immutable, not alterable; and secure. Blockchain gives us unprecedented capabilities to create and trade value in society. As the foundational platform of the Fourth Industrial Revolution,1 it enables such innovations as artificial intelligence (AI), machine learning, the internet of things (IoT), robotics and even technology in our bodies, so that more people can participate in the economy, create wealth and improve the state of the world. Like the first era of the internet, this blockchain era should not be governed by nation states, statebased institutions or corporations. How we govern the internet of information as a global resource serves as a model for how to govern this new resource: through a multistakeholder approach using what we call “global governance networks”– a concept developed in our previous multimillion-dollar programme investigating multistakeholder networks for global problem-solving.2 We discuss seven types of networks: standards networks, such as the Internet Engineering Task Force; knowledge networks, such as the Internet Research Task Force; delivery networks, such as the International Corporation for Assigned Names and Numbers; policy networks, such as the Internet Policy Research Initiative at the Massachusetts Institute of Technology (MIT); advocacy networks, such as the Alliance for Affordable Internet; watchdog networks, such as the Electronic Freedom Forum; and networked institutions, such as the World Economic Forum. We explain the core differences between the internet of information as a network of similar networks and the blockchain as a balkanized internet of value, where real assets are at stake. Then we cover what we have found to be the most urgent threats to this resource, which we view as governance challenges. By governance, we mean stewardship, which involves collaborating, identifying common interests and creating incentives to act on them. We do not mean government, regulation or topdown control. 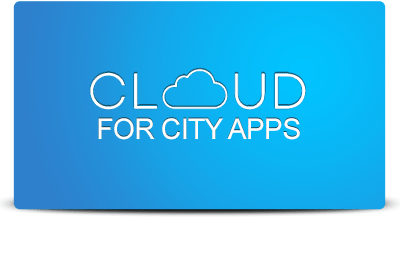 We explore governance needs at three levels: platform, application and the ecosystem as a whole. Unlike the internet of information, which is a vast network of similar networks, this internet of value requires stewardship at not just one level but three. At the platform level, we look at bitcoin’s scalability issue and energy consumption, Ethereum’s switch to proof-of-stake and crisis management by consensus, and Hyperledger’s call for both urgency and moderation around standards. At the application level, we look at the need for oversight, skilled talent and user-friendly interfaces. At the overall ecosystem level, we look at the need for a proper legal structure, regulatory restraint, diversity of viewpoints and scientific research in tandem with business development. We introduce each of the eight stakeholders in the ecosystem: innovators, venture capitalists, banks and financial services, developers, academics, non-governmental organizations (NGOs), government bodies, and users or citizens. We apply our previously developed “global solution networks”3 (GSN) framework to blockchain governance. We urge stakeholders in the space to codify their common ground through standards networks; welcome stakeholders with radically diverse views of what needs to be done through networked institutions; respect members’ interests and constraints through advocacy networks; ensure that no one does any harm through watchdog networks; participate in policy debates and coordinate regulation through policy networks; get up to speed through knowledge networks; and keep incentives for mass collaboration in mind through delivery networks. Finally, we outline the most pressing governance work to be done, if we are to preserve and steward this new global resource to achieve its vast potential.